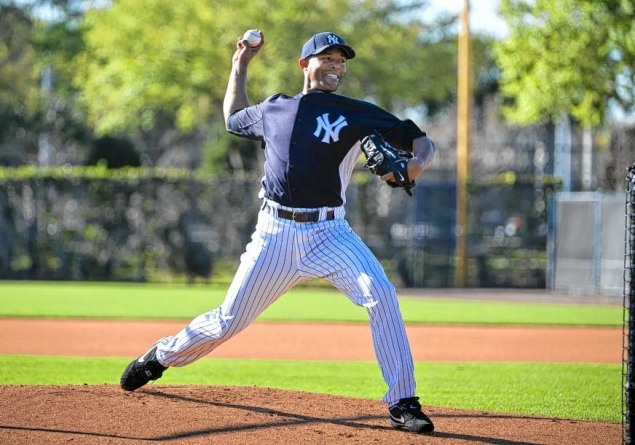 3/5/12, "Rivera Hits the Mound," NY Times Bats Blog, David Waldstein, Tampa, Fla.
"Mariano Rivera threw his first batting-practice session Monday and is scheduled to throw one more, possibly Friday, before he pitches in a Grapefruit League game.... Last year, at age 41, Rivera had 44 saves with a 1.91 E.R.A., which is a fairly typical season in his probable Hall of Fame career. He also became the career saves leader with 603." "Probable" HoF career? Do you know something we don't? There's never been a lock for a reliever like Mo." March 6, 2012 at 10:57 a.m. Exactly. Probable? The chance that Mo doesn't get in is the same as the chance that I get in." Above of Rivera posted on NYY Fans around 10:30AM, Tues., Mar. 6. It looks like it's the BP outing he had March 5.